Following synagogue massacre, does he still believe event was a "success"? 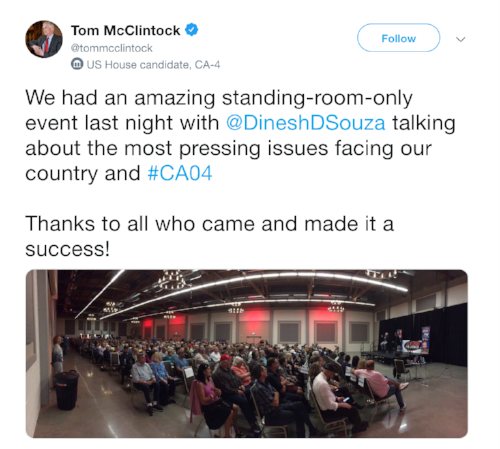 ROSEVILLE, Calif. – On Thursday, Congressman Tom McClintock hosted an in-district campaign event with controversial filmmaker and political commentator Dinesh D'Souza. Long known for peddling racist and anti-Semitic conspiracy theories, D'Souza pled guilty to a felony count of making an illegal campaign donation in 2014, but was pardoned by President Trump earlier this year. As can be seen in a tweet posted October 25th, McClintock deemed the event a "success." Yet after the fatal shooting of 11 innocent worshipers at the Tree of Life synagogue in Pittsburgh over the weekend, does McClintock still stand behind D'Souza and his "success" of an event? In fact, McClintock chose to stand side-by-side and campaign with D'Souza despite his long history of anti-Semitism. In response, Los Angeles Times columnist Michael Hiltzik wrote today: "No one in his or her right mind would turn to Rep. Tom McClintock (R-Elk Grove) for moral leadership or, for that matter, intelligent policymaking." "The tragedy and violence this past week reminds us what is at stake in this election – the healing of our nation. We must no longer tolerate a culture that defines political opponents as 'evil' or our enemies," said U.S. House candidate Jessica Morse. "My opponent in this election has lost sight of this vision for healing and dialogue, and instead manufactures divisions among neighbors, blames others for challenges, and refuses to take responsibility for the consequences of his votes. Next week, we must elect a new class of leaders who inspire rather than divide."